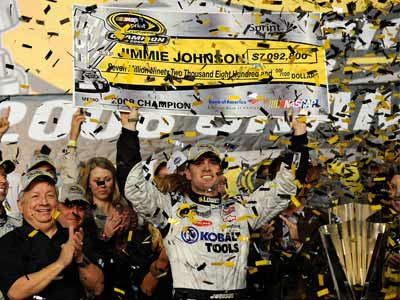 As it does each year, Forbes released its list of NASCAR's most valuable teams yesterday. It comes as no surprise that each of the top ten teams is based in the Charlotte area, but if you've never seen this annual list before you might be surprised to see how much these teams are worth. Actually, it's really all about the top two. Hendrick Motorsports--home to Gordon, Johnson, Earnhardt Jr., and Martin--is ranked number one for the umpteenth consecutive year, with an estimated value of $350 million (a 4 percent increase from last year). Roush Fenway Racing is valued at $270 million, but that's a 14 percent decrease. Beyond them, no other team is even close to $200 million. Even though the article points out NASCAR's declining TV ratings and what has become obvious--the negative effect this economic recession is having on the sport, largely because of lost sponsorships--it reveals that the rich (teams) keep getting richer: "Fighting for a bigger slice of a shrinking pie have been the sport's most valuable teams, which continue to consolidate power at the top of the Sprint Cup Series standings. To date, all 13 races have been won by five of the sport's most valuable teams."